Malnutrition underlies 52% of all under-five deaths in Zambia. The 2016/17 Zambia Demographic and Health Survey notes that 40 percent of children under five are either stunted or wasted (stunted is age-to-height and wasting is weight-to-age). programs’ to cover the cost of production. Read more about the product in our September 2018 Newsletter. We are in the final stages of testing a new products which we hope to start marketing in February. New equipment is on order which will speed up the packaging process. Delivery is due in January. 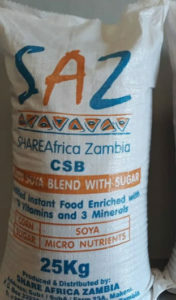 Chicken feed is now being produced using broken groundnuts, soya and maize. The new office block is taking shape. We aim to have it complete in February.